Opinion: The Industry 4.0 Rant – why can’t we just keep it simple? Manufacturing, as we all know, is about taking base materials, processing them, and creating new products which are more than the sum of their parts. Dan Burrows from Waterstons shares his thoughts on Industry 4.0, IoT, 4th Industrial Revolution, IR4, 4IR, or whatever your business chooses to call it and actually how this plays a part in manufacturing as we know it. Unfortunately, manufacturing experts and manufacturers don’t stop at raw materials. We’re also big fans of taking simple concepts and processing them with the benefit of our experience. We add ‘value’ and come up with ‘products’ in the form of big, scary monsters of things which we can all talk about and worry about ad infinitum. So, we have ‘Industry 4.0’, ‘Industrie 4.0’, ‘IR4’, ‘4IR’, ‘The Fourth Industrial Revolution’, etc. I mean, come on – we can’t as a sector even agree on what to call it, so how the heck is anyone meant to understand what it’s all about? Having built a career working with manufacturers to advise, guide, and support them in improving their businesses, this isn’t the first time I’ve felt frustrated at our sector’s inability to just ‘Keep Things Simple’. We’ve had the Lean revolution, we’ve chipped away at the ‘Big Data’ coalface. Now we have something else to focus our efforts on. So, as a big fan of the principle, I’m going to ‘Keep It Simple, Stupid’. First of all, let’s just call this thing IR4 (because I’m a lazy writer and it’s fewer characters). Now, with that out of the way, let’s break it back down into its raw materials and take a quick look at why it’s not as big a deal as everyone’s making out. So, IR4 isn’t all new. Let’s just get that out of the way, shall we? Sure, the IR4 concept brings together a number of changes and improvements to the environments in which we make stuff and so is a useful wrapper to put around things, but the individual changes themselves aren’t all fresh off the line. So what does IR4 mean to you? Chances are you’ve been to the EEF conference, seen a presentation by Siemens, or an academic expert, or even a vendor of ‘IR4’. Chances are also that you’ve left that conference or presentation even more mystified and confused about just what you’ve got to do in your own business. Whether you make cars, crisps, or chips (potato or silicon… I’ll just leave that there) there’s no denying IR4 is coming. Apparently. In my own opinion (and do please feel free to contact me and argue with challenge it), there’s a desperate need to make all this a LOT easier to understand. It’s about automating your production line, automating repetitive tasks like raw material resupply, order processing, invoicing and the like. Sure, the standard IR4 presentations will show a video of a robot building a ‘Body in White’ in a car plant, but there’s a lot more to automation than that. Automation doesn’t have to be expensive robots in spotlessly clean environments. It can be about EDI (a lot of you already know about that, eh?). It can be about automating procurement off the back of order-book based MRP. It can be about providing customers with data as part of the default product pack, rather than by exception; or it could be making sure each piece of production kit has the right data provided by the previous piece. If you want to go wild, sure, it can also be about robotic arms and human-free production lines… but let’s try and walk before we run. Facilitating the automation of processes, there’s an underlying theme of integration. That may be as simple as ensuring that your business systems talk to each other and share a single, master data record. It might be integration between your systems and those of your customers and suppliers; live, pro-active re-ordering by your customers based on their sales or demand to smooth out peaks in their order profile, or seamless real-time views of raw material stock at your suppliers to ensure they can get you what you need when you need it. 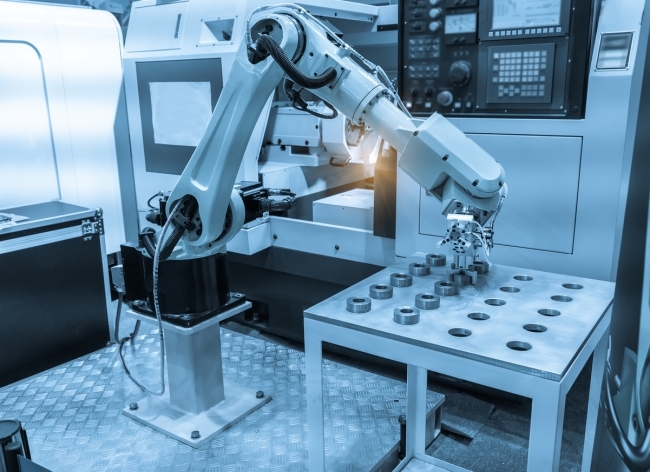 It might be about making sure your machines and production lines are all able to be programmed with production instructions straight from ERP, or giving the production lines the ability to self-manage their power consumption by varying their speed dependent on planned output. There’s an almost limitless range of ways to make one thing, system or business ‘talk’ to another; and almost limitless possibilities for improvement by doing so – but again, I bet you’ve already done some of this stuff… Am I right? You’ll have heard references made to ‘data driven manufacturing’ in those IR4 presentations. You’ll have been through the worries about Big Data, Business Intelligence, and all that too; so you’ll be familiar with the basics of this theme. It’s all about making the data you hold, and the data you create work for you. 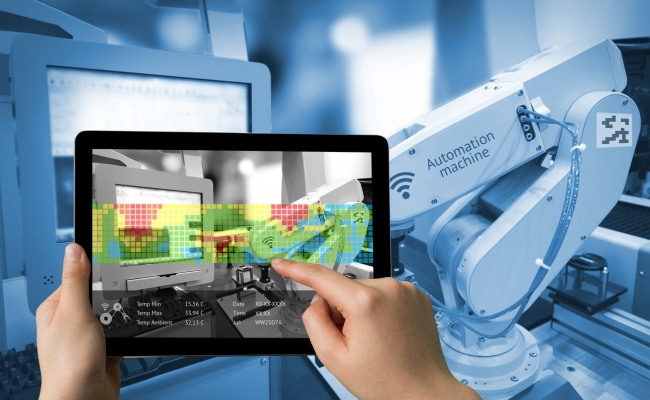 Manufacturing processes generate a ton of data; whether it’s line performance, testing results, quality control data, machine tolerances or cycle times; all of that data has some value, but few businesses really extract that value effectively. Imagine a world where you can identify potential product quality issues before they happen by monitoring the precise parameters of your production line, or where you can charge a premium for your product because you can give your customers exact details of its provenance and quality 100% of the time. What about simulating the effects of a change in raw material quality, line speed, changes to product type, recipe, etc? Build a model using real data, change some parameters, re-run the model. You probably do some of this stuff already, but maybe at the moment in Excel? Then there’s monitoring the performance of products in the field, and using that knowledge to build quality into the next generation – that’s all we’re talking about with ‘the Internet of Things’. Finally, the interesting one. Innovation; it’s what drives you, right? It’s why you make things in the first place and why you have a ‘new, improved recipe’ product every year or two (unless you’re Coca Cola, in which case it’s new, improved, and then removed when you find the market doesn’t really want ‘new Coke’). Leaving that aside though, innovation in manufacturing comes in many forms. Generative design – leaving computers to do the hard work in enhancing product design (using that data stuff again! ), reducing waste, or improving the production process. Or perhaps you’re manufacturing additively now, using 3D printing to augment your capabilities and bring new, previously impossible-to-make products to your market. You might be designing new factories or production lines in 3D virtual worlds, testing them, simulating their installation and maintenance before ever picking up a screwdriver to start putting them together. Or you might be holding meetings using augmented reality devices to show your customers what their products will really look like in 3D before you ever even fire up the production line. You’ve probably experimented with some of these things already; you’ve probably been using 3D CAD for years for design and engineering processes; and you’ve probably got at least one ‘geek’ in your business who would just LOVE to get their hands on a set of VR goggles or an AR headset. Have you found them yet? Let’s not get hung up on all this IR4 stuff. It’s not necessarily a big deal, and you’ve probably already made steps towards an IR4 future. It’s not all scary, and to be frank, you don’t necessarily even need to DO it all. IR4 means different things to different people. It’s something you will need to look at, certainly; and you’ll need to work out just where these technologies and improvements can add value; but you’re certainly not going to need to do it all at once. 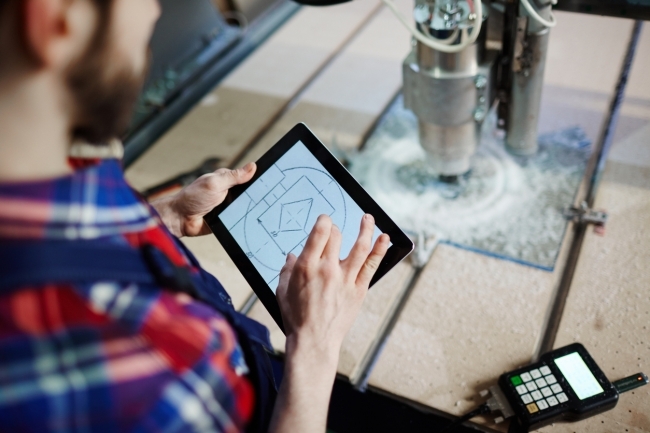 There’s a lot of businesses out there trading on their ability to sell you ‘Industry 4.0’ as a black-box of ‘stuff’, but that’s no good if you don’t need it. I can’t come to your factory, put a thing on your boardroom table and instantly bring you into the fourth industrial age. I can help you understand where you want to get to, and help you plan how to get there – but your journey will be yours and yours alone.